Technology breeds futurity, transforming tomorrow into now. Dared by the genius inventions of past dreamers, the next generation is compelled to make things better, faster, and more efficient. In the 1970’s, people laughed at the idea of having handheld mobile communications computers in our pockets. The daydreams of hirsute hippy techies are now changing the world we know, seemingly making physical distance and time immaterial in the age of the internet. Humanity is on the cusp of one of the largest technological booms the world has ever seen and smartphone technology has been one of the leaders in this bold new era. Since we are only several years into the smartphone boom, one would have to wonder what smartphone technology will look like 30 years from now. Well, I may not have 1.21 gigawatts, a rust-bucket Delorean, or a fully-functioning flux capacitor but I have found a way to catch a glimpse of the future of mobile technology (thank you Scott Bakula). So close your eyes (metaphorically speaking), take a deep breath and let’s take a glimpse into the future of smartphones in 2048. You enter into a white room with music instantly playing the oldies of 2018 into your microscopic audio implants. How did the implants know that you like Bruno Mars’ hit song “Finesse”? You see a smooth black sofa and whitewashed walls (a minimalist’s dream). You sit down. Out of nowhere, holographic images appear in your line of sight. You’re wearing AR glasses, very thin and stylish ones. “What the hell?” you fearfully whisper. 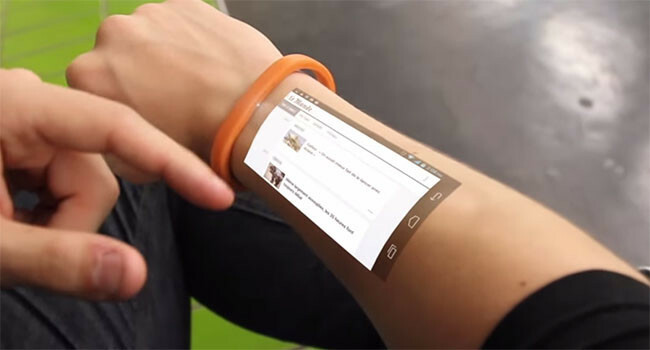 A French startup is close to selling the holographic Cicret Bracelet. Jumping out of the chair in full freak-out mode, you look at your thin orange wristband and you realize that it's somehow seamlessly interfaced to your glasses, showing you a 3D hologram of the weather; cloudy and 20 degrees. The wristband and the glasses are sharing information with each other and now the voice inside your audio implants somehow knows as well, showing a hologram of your increased heart rate and sweating through your glasses. You see lasers from your specs pointed at your left pocket. Suddenly an image appears in your line of sight that shows what’s inside: an iPhone X. You pull it out. Fighting the feeling of being undressed by all of this roving interconnected tech, you turn it on. You chuckle at the sarcasm of your O.S., amazed at how human he sounds and reacts. And then you realize something. Where are the smartphones? Just as you think it, a small clear glass box (the size of a silver dollar) buzzes from within your shirt pocket. You reach for it, noticing that it is opaque with no markings, only a cool stylized engraving that reads, “iC”. You activate the device, “iConnect On.” Instantly the images coming out of your glasses shut off, somehow coordinating with your small glass box and the audio implants embedded in your ears. “Take ‘em off,” says Charlie. Open Air-Gesture TUI tech is making great developmental strides. Suddenly the same screen that was in your glasses, the same icons, and layout in your AR glasses and holographic wristband is now on the wall in front of you. 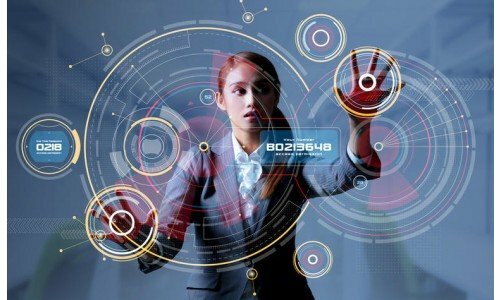 By simple voice and gesture commands from your hands, you immerse yourself into an interactive 3-D holographic world where everything is literally at your fingertips, tossing spam to the trash with your hands and combing through personalized media and e-commercials that include your name. It is even indexing your own memories and dreams from the last several months. Amid of all of this overload of visual and audio stimulation, you look down at your measly little iPhone X.
You’re back in your cluttered home in 2018 with your iPhone X in hand, feeling so robbed . . . so technologically unsatisfied. Your device’s meager 5.8 inch Super Retina home-screen, and now seemingly inferior $1,000 functionality seem like toys for tots in comparison to what you’ve just experienced. And that’s the point. In 2048 you won’t really know what is your smartphone and what isn’t because things will be so seamlessly interwoven and interfaced one into the other that the line between what is a smartphone and what isn’t will be considerably blurred. You'll, in essence, have a SMART HOUSE. Your artificially intelligent OS will be synced between all of your communications devices, making communications, business, social interactions, and your leisure video streaming time seem like a never-ending joyride. Makes you want to get older really fast, doesn’t it?